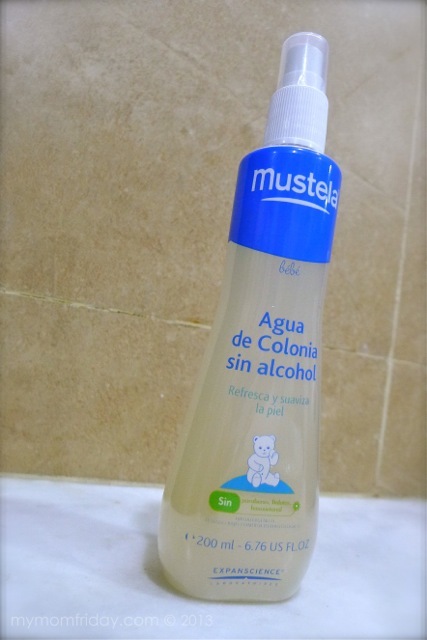 My initial impression on Mustela is that the brand is only for babies. I've heard about it from friends and I've seen their stalls in malls, but I never really paid much attention since I felt they are not relevant to me anymore. Irrelevant because I don't have babies nor toddlers, so I have no use for their products. I was wrong. Frankly, I am very wary about trying new skin care brands for the family and for myself, especially those used for the face. And at my age, I cannot afford to experiment with unfamiliar products. Since I've heard only good things from my friends who highly recommend this European brand, I was more open to trying them out for myself and for my children. So last month, I received this set of Mustela skin care products. 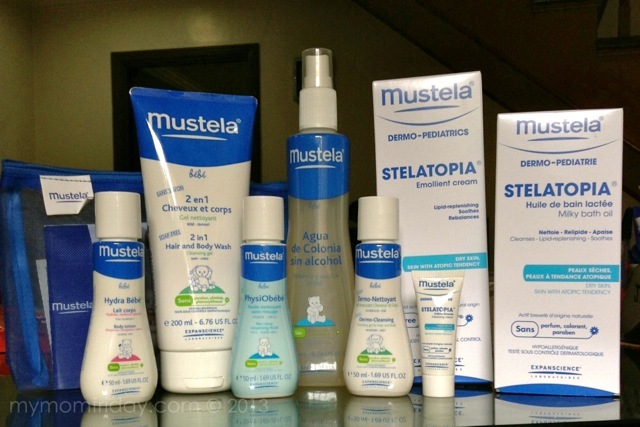 Tammy, of Mustela Philippines, was thoughtful enough to ask about our personal skin conditions so she can send Mustela products that will match our specific needs. My boy has no special skin condition, except having a tendency to get dry. He dislikes strong fragrances and sticky lotions on his skin. My girl, however, has eczema since she was a baby - more commonly known here as skin asthma. It's different with me - what's strange is that I've been having seborrhoeic dermatitis in some areas on my body since late last year, which I never had while growing up. I only learned about this condition after consulting with a dermatologist. Sorry, I was not able to take photos of earlier red patches on her. This photo only shows some light redness and a dry scaly, itchy portion on the girl's arm. She had far worse conditions before, on her other arm, and legs, and some parts of her back. What is atopic dermatitis this anyway? We've been using different medicated creams to sooth skin flare ups for my girl and myself. Though effective for quick relief, some contain harmful chemicals, like steroidal creams, especially with prolonged use. Cleansing Cream, and Agua de Colonia for myself. We are instant Mustela fans! This oil can be used during flare ups. 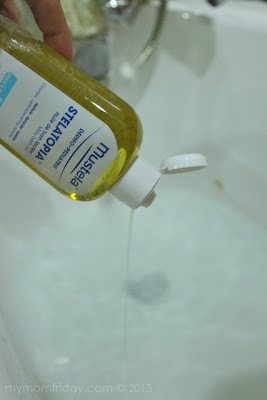 After bathing, pour 2 caps of oil into a basin of water then pour over body or affected area. Use this at least once a week to help prevent or lessen flare ups. Instantly, her skin became soft, supple and moisturized. Not oily at all. No more itchiness! 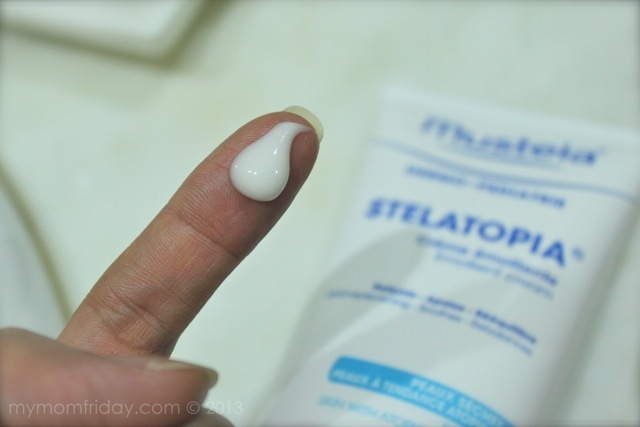 Stelatopia Emollient CreamIt acts as moisturizer for face and body for atopic skin. It helps relieve itchiness due to dryness. With just a small amount, we use this on specific areas with dry patches for instant relief and moisture. Light and creamy texture, that is quickly absorbed by the skin. My girl's red, itchy patches were gone after a few days of using this emollient. Stelatopia not only moisturizes, it also protects the skin barrier and it has an active lipid replenishing process (which 100% of other brands for eczema do not have), which means it activates the production of essential lipids to improve and, therefore, repair the skin. 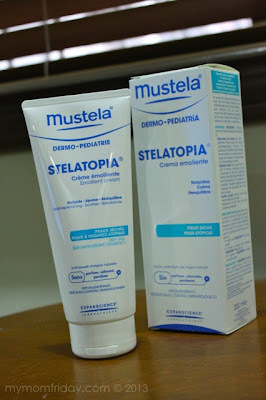 Note: Stelatopia for atopic dermatitis is not medicine. It's a more natural alternative with no harmful chemicals to initially address skin problems, before resorting to use actual medicines. 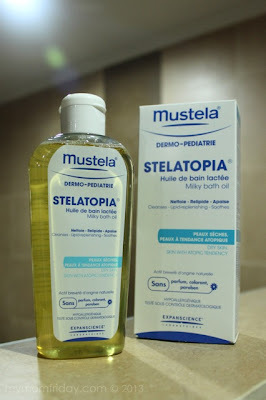 Mustela Bebe line is for normal skin, and everyone can use them, not just babies. This cologne has a fresh baby scent, as I featured here on #my3things. I share this with my kids as our everyday scent. It is alcohol-free, so it's perfectly safe for babies, even newborns. Since it's alcohol-free, don't expect for the scent to linger the whole day. We spray this on as often as we feel like it. Okay, I don't have a baby anymore, but my girl loves using this head-to-toe wash! 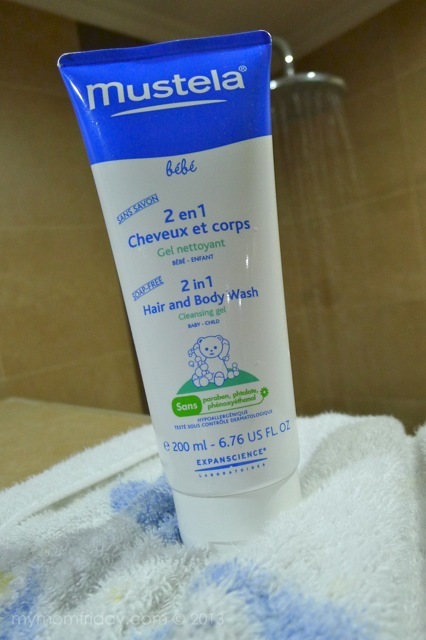 When she ran out of shampoo, I handed her this tube and we both liked the milky wash, that's super mild and lightly scented. It washes easily and leaves no residue on the skin. It is soap-free, and has no harmful chemicals as with all Mustela products. You can get product updates from Mustela Philippine's Facebook page here. Click here for the list of outlets.